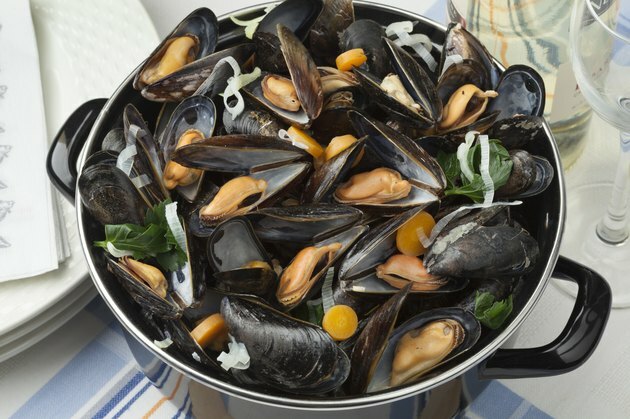 Mussels by themselves are very nutritious and filled with essential nutrients. They aren't very high in calories if you steam them, which is one of the more typical ways to prepare these shellfish. Cooking them in a cream sauce or stuffing them, however, will greatly increase their calorie content. A 3-ounce serving of mussels cooked with moist heat contains 146 calories. This is a bit higher than some other types of seafood you might choose. For example, the same amount of steamed lobster has 76 calories, and a 3-ounce serving of steamed shrimp has 101 calories. The mussels are much higher in nutrients, however, with more vitamin C, niacin, riboflavin, thiamine, folate, vitamin B-12, iron, selenium and manganese than either lobster or shrimp. It also has less sodium. Vitamin C, selenium and manganese are all antioxidants that help keep your cells from becoming damaged by free radicals, and the B vitamins help turn the food you eat into the energy you need. You need iron for forming red blood cells and carrying oxygen throughout your body.